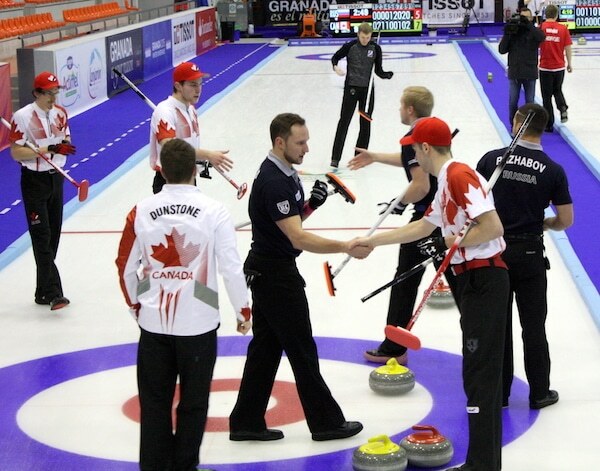 On a must-win day, Team Canada men came through with two solid victories to climb back into contention at the 2015 Universiade in Granada, Spain. Matt Dunstone and his Winnipeg team of third Jim Coleman, second Daniel Grant, lead Chris Gallant and coach Scott Grant came into Sunday morning’s game against the Russian Federation’s Evgeny Arkhipov with a 1-3 record and in desperate need of some wins. They delivered, posting a solid 9-5 victory over the Russians and following that with an impressive 11-2 win over Spain’s Sergio Vez in evening play. 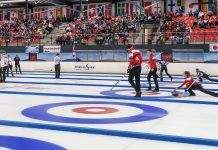 In the game with Spain, Canada controlled play, taking multiple points with hammer and securing the win with a six-ender in the seventh. On the women’s side, skip Breanne Meakin, third Lauren Horton, second Lynn Kreviazuk, lead Jessica Armstrong and coach Doug Kreviazuk continued their roll through the field, dominating in a six-end 16-2 win over the host country’s Patricia Arbues. 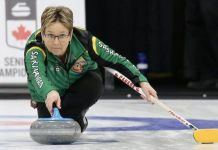 Meakin and her Ottawa-based team remain undefeated at the top of the standings, followed closely by the Russian Federation’s Anna Sidorova and Sweden’s Sara McManus, both with 5-1 records. On Monday, the Canadian women face Norway’s Pia Trulsen (3-3) at 3 a.m. EST and Sidorova in the evening game at 3 p.m. EST. The men will try to keep the wins coming with one game against Norway’s Steffen Walstad at 9 a.m. EST.